Thomas Nast, whose portrait, engraved by his friend, W. L. Thomas of London, appears in this issue, and who is most agreeably known to the readers of Harper’s Weekly, is the son of a musician in the Bavarian army, and was born in Landau, Bavaria, in the year 1840. When he was six years old his parents came to the United States, bringing their boy with them. They were very poor, but their industry presently made them comfortable. The boy showed from the beginning his fondness for drawing; and although his parents were very sure that it was folly to devote himself to any thing but a mechanical trade, he persevered in his artistic studies. Upon leaving school he drew with Kaufmann for six months, and had no further instruction from a master. But of all Nast’s works his pictures for this paper are undoubtedly the most characteristic and important. They are of an allegorico-political character, at once poems and speeches. They argue the case to the eye, and conclusively. A few lines does the work of many words, and with a force of eloquence which no words can rival. During the great Presidential campaign of 1864 these pictures were powers. “The Chicago Platform” was irresistible. The dishonor and essential treachery of the Democratic Convention, that wretched tender to the Rebel Congress, were exposed with unsparing and overwhelming skill. The baseness, the cowardice, the insincerity, and the inhumanity of the Chicago plotters were revealed to every man and woman in the land. 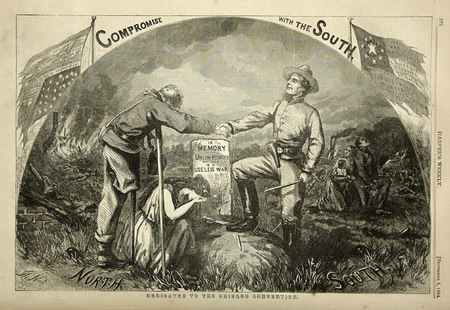 This drawing and “Compromise with the South” were prodigious batteries. Their influence upon the glorious result of the campaign was undeniable. Nast’s artistic instincts carried an incredible weight in the nineteenth century, and still bear upon us today. We identify Republicans with elephants and Democrats with donkeys, both products of Nast’s instinct. His cross-hatched caricature transfigured outrage into sarcasm. Nast’s pictures caused more public outcry to social scandal and political corruption than the articles surrounding them for the same reason I took notice in my copy of Huckleberry Finn: visual art is immediate. New York political “Boss” William Tweed reportedly said, “I don’t care a straw for your newspaper articles; my constituents don’t know how to read, but they can’t help seeing them damned pictures.” When finally convicted of fraud, Tweed’s attempt to flee prosecution was prevented by officials in Spain, who identified the fugitive using one of Nast’s cartoons. SANTA CLAUS AMONG OUR SOLDIERS. Children, you mustn’t think that Santa Claus comes to you alone. You see him in the picture on pages 8 and 9 throwing out boxes to the soldiers, and in the one on page 1 you see what they contain. In the fore-ground you see a little drummer-boy, who, on opening his Christmas-box, beholds a jack-in-a-box spring up, much to his astonishment. His companion is so much amused at so interesting a phenomenon that he forgets his own box, and it lies in the snow, unopened, beside him. He was just going to take a bite out of that apple in his hand, but the sight of his friend’s gift has made him forget all about it. He has his other hand on a Harper’s Weekly. Santa Claus has brought lots of those for the soldiers, so that they, too, as well as you little folks, may have a peep at the Christmas number. One soldier, on the left, finds a stocking in his box stuffed with all sorts of things. Another, right behind him, has got a meerschaum pipe, just what he has been wishing for ever so long. Santa Claus is entertaining the soldiers by showing them Jeff Davis’s future. He is tying a cord pretty tightly round his neck, and Jeff seems to be kicking very much at such a fate. He hasn’t got to the soldiers in the back-ground yet, and they are still amusing themselves at their merry games. One of them is trying to climb a greased pole, and, as he slips down sometimes faster than he goes up, all the others who are looking at him have a great deal of fun at his expense. Others are chasing a greased boar. One fellow thought he just had him; but he is so slippery that he can’t hold him, and so he tumbles over on his face, and the next one that comes tumbles over him. In another place they are playing a game of foot-ball, and getting a fine appetite for their Christmas dinner, which is cooking on the fire. See how nicely the soldiers have decorated the encampment with greens in honor of the day! And they are firing a salute to Santa Claus from the fort, and they have erected a triumphal arch to show him how welcome he is to them. But Santa Claus must hurry up and not stay here too long; for he has to go as far south as New Orleans, and ever so far out West; so he says, “G’lang!” and away he goes through the arch like lightning, for he must give all our soldiers a Merry Christmas. Ought it not to be a merry Christmas? Even with all the sorrow that hangs, and will forever hang, over so many households; even while the war still rages; even while there are serious questions yet to be settled—ought it not to be, and is it not, a merry Christmas? How well Mr. Nast has seized the spirit of the great festival in the elaborate and beautiful picture which we publish this week! The central scene is the home of the soldier and his Christmas welcome from wife and darlings, for just that is the central scene of our American holidays this year. It is the soldier who has saved us our homes and filled our holidays with joy. It is the soldier who is lifting the dark winter-cloud beyond which smiles the bright spring of national regeneration. It is the soldier who is securing the peace that will make the life of the children sleeping together in the crib, and over whom the dear old bear, Santa Claus, is bending, a long and happy holiday. Next year let us hope that the delicate, and thoughtful, and forcible pencil of our friend Nast may draw a picture of the National reunion, of the return of the prodigal who has been living on husks and with harlots, the rebel soldier returning to his country and his fellow-citizens, the soldier who did not know that in fighting the brave man whom we see in the picture of to-day, he was fighting his true friend, as well as honor and liberty. Peace on earth is the Christmas benediction. Blessed then the brave men upon the Rio Grande, in Louisiana, along the Mississippi, in the mountains of Chattanooga, in the Valley at Knoxville, upon the Potomac, and the Rappahannock, and the James River; among the North Carolina barrens and the South Carolina Islands, with the great army of sailors upon the rivers and the sea—to all, whether on sea or land, heroes of the good cause, honor and blessing; for their stout hands and hearts, with the supporting sympathy and faith of the whole people, are the peacemakers of the nation. And all to deck the great white fort in honor of Christmas-day. Telling the Christmas joys and mirth that blessed their own dear land. Bare-headed in the soft south air they stood a moment’s space. By 1890, Thomas Nast’s run at Harper’s Weekly was over, but not before he published Christmas Drawings for the Human Race for Harper & Brothers. Woodcutting, the technology behind Nast’s mass-produced illustration, was ten years’ past its prime. When publishing companies moved to the far more accurate photoengraving and halftone processes, Nast’s illustrations became crude by comparison. But the symbols of Nast’s visual allegory continue to carry weight while our social urge for higher definition carries us toward a virtual reality lacking any substance. I would like to end with an image that portrays the convergence of old with the new, tradition and technology, created by Thomas Nast at the same time he hosted Mark Twain and George W. Cable for Thanksgiving in 1884.